The only thing you must remember when hiking and backpacking in the Cascade mountains of north central Washington is to put one foot in front of the other —about 98,000 times if you’re starting at Harts Pass and going to Rainy Pass on the Pacific Crest Trail. A.C. Woolnough, right, and grandson Brandon share a selfie. Courtesy photo. Despite my vehement and absolute conviction that I would never participate in Pass to Pass for Parkinson’s a second time, there I was. I really don’t like sleeping in a mummy bag. I really don’t like sleeping on the ground. I really don’t like putting a tent up and then, 12 hours later, putting it back in the aptly named stuff sack. I especially don’t like freeze-dried food. I don’t like using a trowel to dig a hole for personal waste. I don’t like blisters, cramps or hornet stings. There’s a lot I don’t like about hiking 58 miles (2017) or even 32 miles (2018). Why do it? In 1924, British mountaineer and Everest pioneer, George Mallory, suggested, “Because it’s there.” That sounds great, but it’s not enough for me. Two of my grandsons have now graduated from high school. Thinking back, I couldn’t remember a single thing I got as a gift for graduation (way back in 1968). But, some of my fondest memories growing up had to do with travel and experiences. Last year, grandson Jeremy and I spent four days in Yellowstone — memories that will far outlast a thing or some money. Younger grandson Brandon was the recipient of all my camping gear from last year’s Pass to Pass trek partly because I know he likes to hike and camp but mostly to not have it around and tempt me to go again this summer. When asked what sort of adventure he might like, Brandon asked if there was going to be “Another hike for that PD thing?” Drat. I was hoping he’d say Alaska or skydiving. Nope, backpacking with Grandpa — raising awareness and funds for PD research — was his choice. Once that was settled, I started a more realistic training program than I had last year. In case you’re wondering, the Mickinnick Trail and Schweitzer’s Nature Trail are both steeper than 90 percent of the PCT where we hiked. A few times up and back and you’re ready for anything the PCT has in store. It was back to REI for a new pack and bags and bags of freeze-dried slop. A tent and sleeping pad were borrowed and things were looking good. Brandon and I used three different checklists to ensure we were prepared. We headed out (trip leader Brian driving because my vehicle was in the shop after being rear-ended the day before) and made it to Winthrop for a barbecue lunch courtesy of Pirate Brian and Esther who joined us at Harts Pass to make the trek. I’m not sure if I’m lucky or if I learned something from last year’s mistakes, but there were no stings, cramps or blisters. There was, surprise, smoke. The first two days we could sense there were magnificent views; we just couldn’t see them. As I was jiggling ideas in my head for things to write and a title for this column, my thoughts drifted to “I came for the view and only got the T-shirt.” On days three to five, things cleared up and we were nearly overwhelmed by the majesty of the mountains, glaciers, cliffs, rockfalls, avalanche chutes and vegetation. And then there were passes. Between the trailhead (factoid: Harts Pass is the highest elevation you can drive to in the state of Washington) and the end at Rainy Pass, we climbed up and over Grasshopper Pass, Glacier Pass, Methow Pass, Granite Pass and Cutthroat Pass. While there was a net descent of 1,300 feet, over the course of 32 miles, we climbed and descended over 9,000 feet. 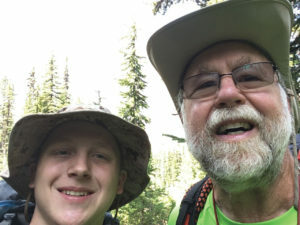 Most important, I got to share this adventure with my grandson. It was an experience we shared that can never be taken away and will not be forgotten. As usual, the trek took cooperation and teamwork — and llamas! Did I mention my favorite four-legged animals each carried 60 pounds of gear that allowed us to carry less? Helping keep our cell phones (cameras) charged and tech questions answered was George — an early onset person with Parkinson’s. Proving one person can make a difference, mention must be made of “Spokane Bill,” the father of Pass to Pass. Between our blaze orange T-shirts and some nice publicity, we tried to be noticed. After all, the purpose of Pass to Pass is to increase awareness, to raise funds for PD research and to demonstrate the benefits of exercise. As a registered non-profit charity, http://passtopass.org, is more than happy to receive your donation. After being diagnosed with Parkinson’s Disease, A.C. is calling on his 37 years in K-12 education to became a “Parkinon’s Warrior”educating the public, advocating for a cure and participating in research. Shake, Rattle and Roll: Who are we? What do we want? When do we want it?